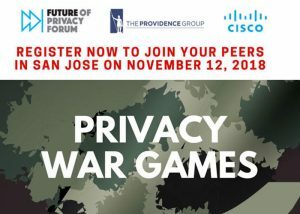 The Future of Privacy Forum and The Providence Group invite you to participate in the inaugural Privacy War Games event on November 12th, from 8:30 am – 4:00 pm, in San Jose, California. The event will take place at Cisco’s Headquarters, located at 255 West Tasman Drive, Building J, San Jose, CA 95134. In recent years, many leading companies have introduced war games in cybersecurity and other strategic areas as a way to ensure that they are fully prepared for key challenges and unexpected risks. Similarly, the national security community has used war games to provide senior leaders deeper insights into issues, assumptions, and often counterintuitive understandings of decision-making that are not usually available from other qualitative research techniques. War games also provide participants an opportunity to participate in activities and wrestle with issues that are not part of their day-to-day experiences or particular fields of specialty. 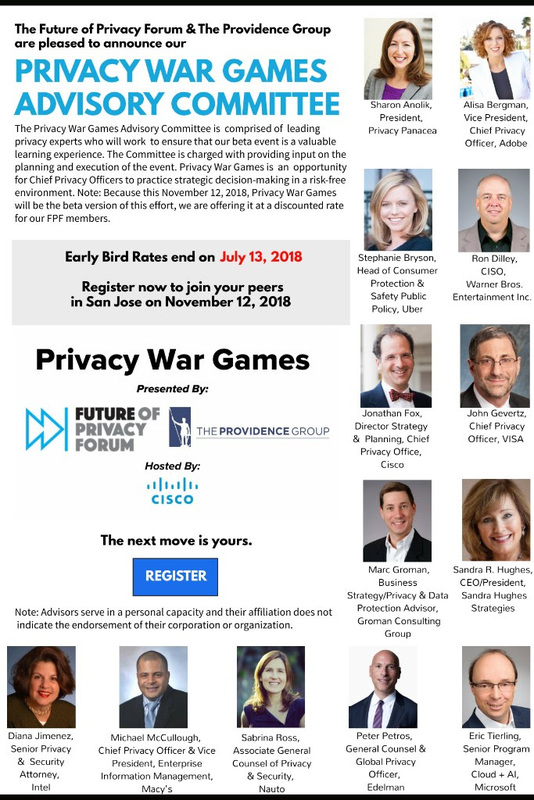 For privacy professionals who are tasked with managing privacy risk, privacy war games can be an effective way to practice strategic decision making in a risk free environment – before choices have to be made in the real world. The Future of Privacy Forum and The Providence Group have collaborated to develop and conduct an analytical privacy war game designed to gain insights that will help privacy professionals manage future privacy risk – an increasingly complex task that is made more difficult by: the increasing number of state and sectoral privacy laws; evolving regulatory and compliance requirements; and the regulatory and legal ambiguity of the European General Data Protection Regulation (GDPR). Benefit from an opportunity to “step into the shoes” of another stakeholder, ranging from business executivies, regulators, legislators, courts, civil society groups, and consumers. Learn what to watch out for as you: analyze and navigate a complex privacy scenario; and react to strategic responses and decisions made by other stakeholders who are playing the game. Take home industry-specific best practices for managing privacy risk. 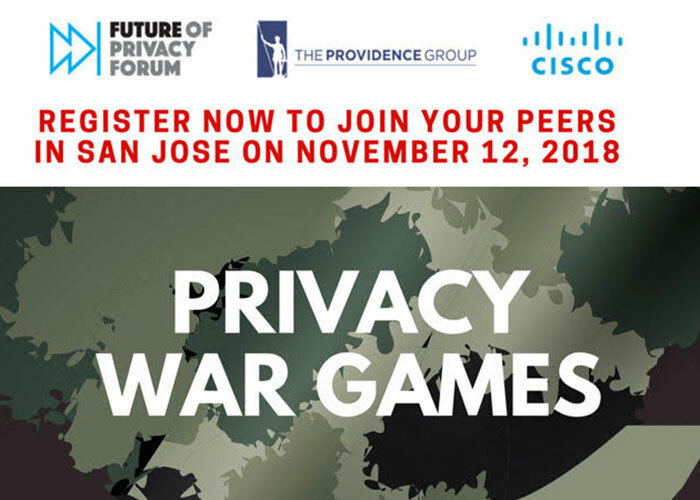 This Nov. 12 Privacy War Games event will be the beta version of this effort, so we are offering it at a discounted price to our FPF members. We will be using the feedback from this exercise to develop a program that we hope to replicate and offer more broadly. Register by July 13, 2018, for special early-bird rates! Email [email protected] for more info. Lunch will be served.